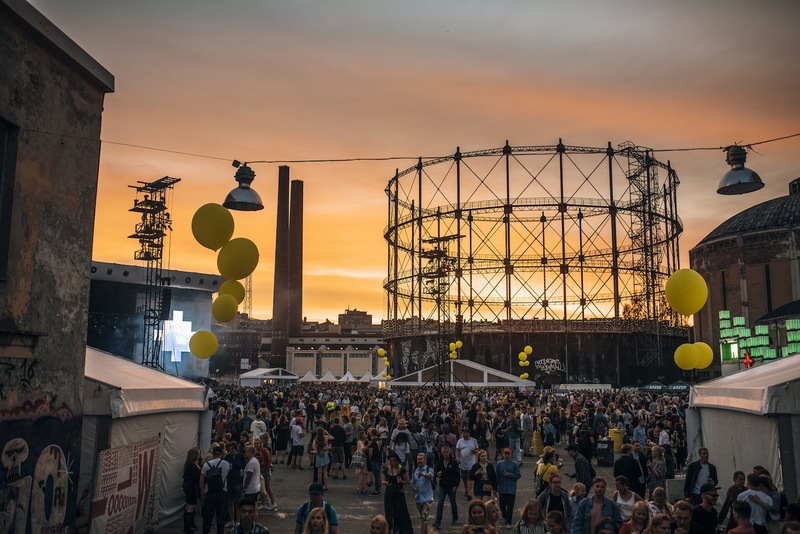 It’s the return of Flow Festival: Helsinki, three days, a lot of promise. Let’s go! We spend the first few hours getting our bearings, exploring the beautiful old industrial site that’s expansive but not too big, so you can flit about with the alacrity of a bee. Then Patti Smith shows up on the main stage, and after an emphatic ‘Gloria’, she remarks, “I’m sorry I fucked [it] up, but it was fun”. It was a jarring comment, not least because any slip-up was fairly imperceptible, but also because you didn’t tend to hear any similar admission over the weekend. It speaks both to Smith’s appealingly childlike drive for authenticity and the sharpness of the rest of the lineup; everything ran like clockwork, except Lauryn Hill. It’s the harder songs from ‘The Miseducation…’ which go down better, rather than the at-times laboured re-workings. From Bonobo, it’s over to Sigrid on the neighbouring Seat Black Tent. Like fellow Norwegian Anna of the North, she has plenty of admirers. Her performance is maybe let down by that of the slightly naff backing band but still shows bags of promise. Alma, a singer who’s massive in Finland (and draws a concomitant crowd), rounds off Friday. Back in 2013 she was on Idols, a Finnish variant of Pop Idol, and while there’s still a hangover of theatricality from that, she now crafts slicker pop more in the vein of Charli XCX, with whom she’s collaborated. Saturday was full of great names, but the allure of the sauna meant we missed Shame early on. On the main stage, Grizzly Bear, like Fleet Foxes the day before, are perfectly boring and a bit stodgy, though advert mainstay ‘Two Weeks’ goes down really well. Arctic Monkeys are great, and Alex Turner, rocking the buzzcut and looking a bit Bono, guides us through songs from every album. ‘One Point Perspective’ in particular sounds very self-assured, and ‘AM’ gets a solid outing alongside material from those High Green days. Charlotte Gainsbourg is one of the highlights of the weekend; Stepping through a series of illuminated frames, she’s more energetic than expected and gives bangers from ‘Rest’ like ‘Deadly Valentine’ renewed vigour. Helena Hauff was hard and raw-edged as expected. Sunday’s line-up looked way more promising than the weather forecast, but we were alright in the end. K-X-P were heavy, droney and weird. There were a lot of Finnish acts from across the spectrum, which was great to see in a world of increasingly homogenous line-ups. Brockhampton are best when they sack off the autotune and really go for it. Lykke Li is also a massive draw with her low-key (if slightly forgettable) brand of pop and commandeering stage presence. The Balloon 360 stage is an incredible space: immersive and in the round, it’s well worth waiting in the queue of polite-but-steely fans for Kamasi Washington, who plays two bonkers, otherworldly sets there. In the second of these, it’s an extended take of ‘Fists Of Fury’ that really has people agog. Kendrick Lamar delivered a blistering, crowd-pleasing set but it did feel a bit anticlimactic. There was the lingering impression that he spent too long time singling out sartorial choices to avoid having to play: “you in the orange jumpsuit”, “the red hoodie, I seen you rocking”. Yeah, and you in the dark hoodie and cargoes, play a few more songs. And you can shorten those video-game style visuals too. That and ill-advised opening sound effects aside, everyone’s loving it. Earlier in the day at the Resident Advisor Front Yard, Moxie plays a good set but doesn’t have the crowd to match, while Yaeji is absolutely rammed. In between, there’s a minute’s silence for journalist and musician with Imatran Voima Perttu Häkkinen, who passed away suddenly over the weekend. Elsewhere, Peggy Gou and Moodymann delivered. On The Other Sound @ Sun Effects Voimala stage, a brick building that’s pitch-dark so as to emphasise the wicked immersive lighting rather than the artists, Jonny Nash (of Gaussian Curve) sounds OK, with subtle washes of guitar over intricate loops, but doesn’t really hit the spot. It’s Colleen ‘Cosmo’ Murphy who steps in with some banging disco. Prevailing over the whole weekend was a great atmosphere – a bit Field Day if outfits were to go by, but far less uptight and much more fun. With 84,000 people (an increase on previous years), it’s so clean and the fruits of a site-wide emphasis on sustainability are clear to see. There’s great food that was never going to be dirt cheap but which was infinitely better than some dodgy Brit fare. We could definitely learn something from them! The Balloon stage could work so well in London… And Helsinki and its islands are lovely, refreshingly devoid of massive crowds but full of interesting architecture for one – the perfect backdrop to three days of top-class music and so much else.